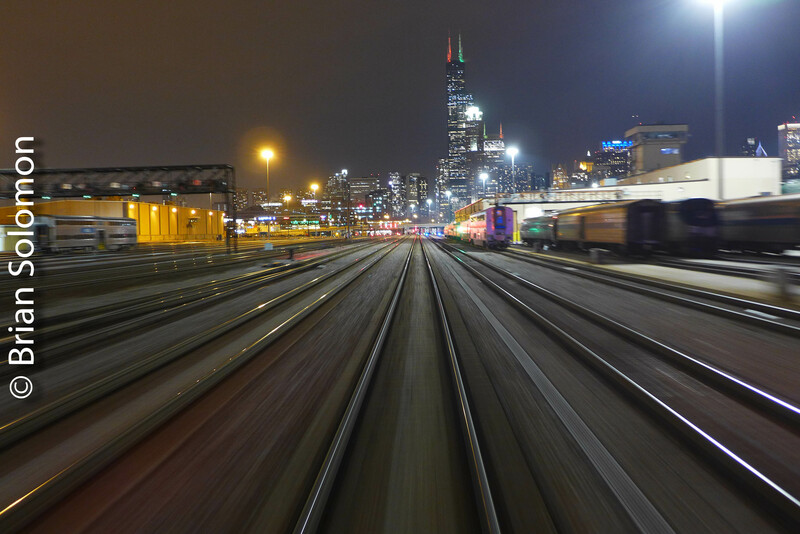 Dynamic View of Chicago Departing Union Station. I exposed this photo from the back of Silver Splendor as it rolled eastward on Amtrak no48, the Lake Shore Limited. For this photo I used my Lumix LX7, and by using a slow shutter speed I allowed the tracks to melt into a sea of motion blur. Exposure details: f1.6 at 1/5thof a second. Camera steadied by the passenger car. Jim Shaughnessy signs his book ‘Essential Witness’ on visit in December 2017. Yesterday, August 7, 2018, my friend Jim Shaughnessy passed away. Jim’s photography and writing are some of the best known in American railroad circles; over the years he has been a strong influence on my own work. He and I often discussed three interests we had in common: Ireland, railways and photography. Jim had been visiting Ireland since the 1960s. In 2005, Jim visited me in Dublin and I gave him a walking tour. 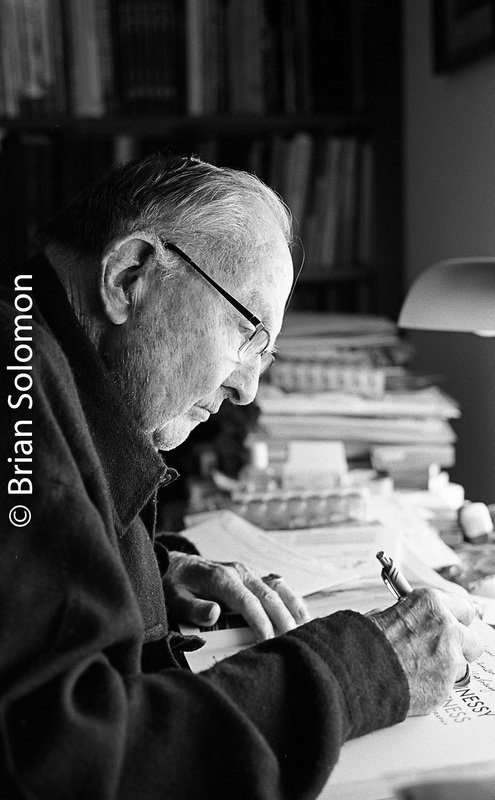 He will be missed; his photography and writing lives on. Jim Shaughnessy with his latest book: Essential Witness. 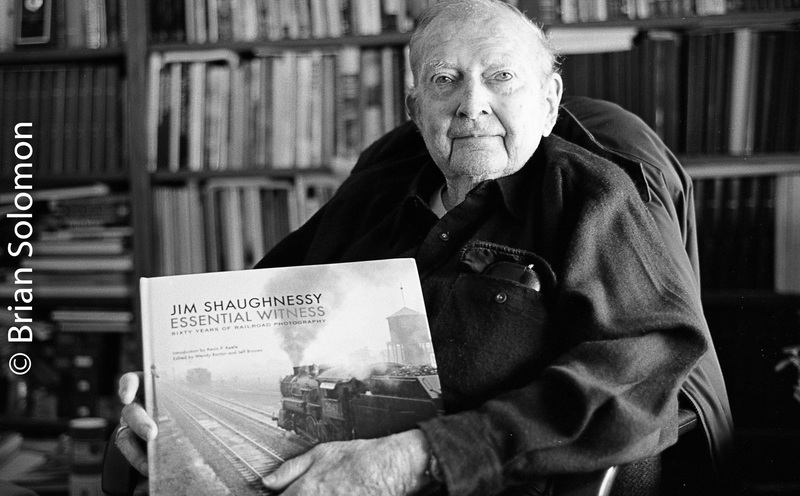 Last month I visited with Jim Shaughnessy, who shared with me his latest book Essential Witness that features some of his finest vintage black & white photographs. I’ve enjoyed this wonderful book, not only for the exceptionally well composed images of railroading, and its beautiful black & white reproduction but because Jim has photographed in many of the same places that I often make my own images. This gives me a greater perspective and appreciation for both railroading and railroad photography. I made these portraits of Jim using my Nikon F3 with 50mm lens. Keeping with tradition, I exposed Kodak Tri-X processed in Ilford Perceptol stock. Strasburg No. 90 in Steam. Gauzy afternoon light in late autumn is a great time to photograph steam locomotives at work. The combination of a relatively low sun angle with slightly diffused shadows, provides directional light with moderate contrast that nicely illuminates the locomotive’s boiler components and reciprocating parts while offering excellent color rendition. This lighting situation is generally superior to harsh midday summer sun that tends to leave locomotive detail in inky shadows and atmospheric conditions that leave steam exhaust largely invisible to the naked eye. Pat Yough and I re-examined Strasburg Railroad in mid-November and made a variety of classic views of locomotive no. 90 at work. Curious Comments on my Photography. I avoid shrouding my work in mystery and I’ve happily discussed my technique, tools and materials with anyone who asks. This can lead to some interesting conversations, but also some peculiar observations. I made this image of a Southern Pacific eastward intermodal freight from the Book Cliffs in Utah near Floy back in 1996 when I was Editor of Pacific RailNews. At the time I worked with Nikons and exposed this view on Fujichrome. You can see a row of trees way in the distance along the Green River. Monday, 9 October 2017—Railway Photography Program by Brian Solomon to be presented in Cork, Ireland. Tomorrow (Monday, 9 October 2017), I’ll be presenting my program on Railway Photography to the Irish Railway Record Society in Cork. This will be held at 8:00pm (2000) at the Bru Columbanus meeting room in Wilton, Cork City. (see Google Maps). I’ll display a great variety of railway images exposed in Ireland and elsewhere, with an emphasis on photos of Irish Rail in counties Cork, Kerry, Tipperary and Limerick. The program will be aimed at enlightening the audience on precisely I how I made images (with detailed technical explanations as required). I’ll take questions at the end. Kent Station, Cork. Exposed on black & white film. Semaphores at Kent Station, Cork. Digital photograph. Mount Holly, Vermont—June 7, 2017; close and closer. Vermont Rail System’s freight 263 climbs at Mt. Holly, Vermont. Both were exposed digitally using my FujiFilm X-T1 with 90mm f2.0 fixed telephoto. Red diesels and lush green scenery under an azure sky make for a pleasant railroad setting. So, which view do you like better? Version 1; The locomotives are slightly further away and there’s more greenery. Version 2; I’ve opened up the aperture about a half stop to lighten up the red engines, which occupy the majority of the photo. Tracking the Light Reads the Rules of Railroad Photography. Avoid distracting or complicated backgrounds. Keep trees and fences in the distance. Amtrak ACS-64 652 leads Keystone train 648 east at Trenton, New Jersey in a December 2015 downpour. Digitally exposed using a Lumix LX7. Tracking the Light has no Rules. Railroad Photography Lesson: Making Modern Ugliness Interesting—Take a Pan photo. Railroad photography isn’t necessarily aided by a windswept empty car park, a host lighting poles, catenary masts, fences, not to mention the metal monstrosity posing as a footbridge. This was the scene at Readville, Massachusetts on Sunday, Morning, December 6, 2015. An MBTA train heading for Boston was due shortly. Since locomotives operate on the south-end of consists, I set up for a trailing pan photo. I focused on the new engine and allowed the setting to settle into a sea of blur. An MBTA HSP46 passes Readville, Massachusetts on Sunday December 6, 2015. This is one means of making the ugliness more interesting. Exposed at 1/60th of a second using my FujiFilm X-T1 digital camera. Contrast controlled in post processing using Lightroom. German Electric in Connecticut—November 2015. Siemens-built ACS-64 640 zips along with Amtrak train number 160 at Milford, Connecticut on the former New York, New Haven & Hartford Railroad. The other day, I made this image from the far end of the station platform. I set my shutter to 1/1000th of a second, pulled the zoom back to its widest position (18mm), and had the drive set to ‘CH’ (continuous high)—which allows for a rapid burst of images. Amtrak train 160 at Milford, Connecticut. This arrangement of settings allowed me to catch the locomotive very close and in sharp focus. This one is a bit more distant but features more of the background and right-of-way. Nice capture on the logo. However, if this had been my only view, I’d be disgusted with my effort.